Jose Graterol Designs captured the essence of the bride and groom in this modern, chic, Miami Luxury Wedding Event in the beachfront hotel, The Edition. As a Miami wedding florist, Jose Graterol Designs is truly the best and most original Wedding Florist in Miami. Each event or wedding he designs is customized to the personalities of the clients. The rooftop outdoors ceremony combined shades of green and white and cream flowers with the silver structure. The colors were then carried into the ballroom with the surprise of the red and fuchsia flowers. Mirrors were used to reflect the ceremony details, too. 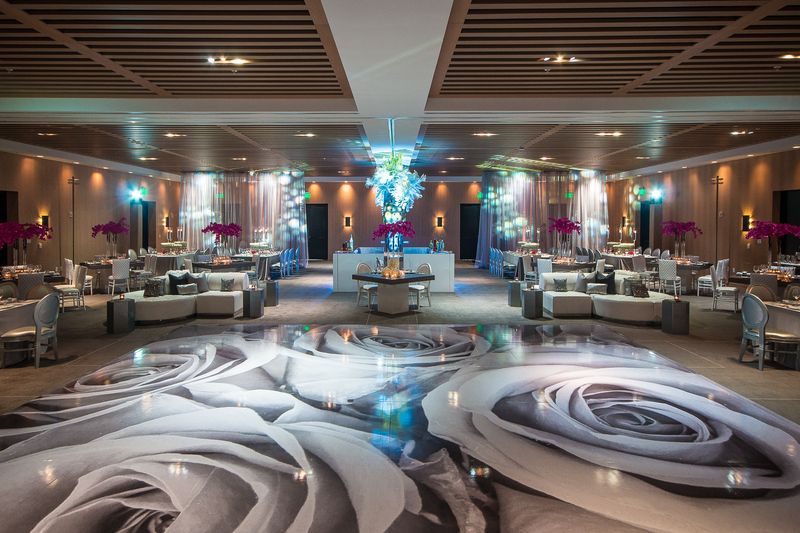 The striking dance floor was designed by Jose photographing a bouquet of roses he created. The dynamic floor plan offered various styles and colors of chairs and lounge seating options. The timeless palette of white, silver, platinum, grey and a pop of fuchsia or red flowers looked so classic and elegant. Instead of table numbers, this well-read couple opted for a word which summarized their favorite book on each table. It was so interesting and a unique conversation starter! The combination of a variety of textures made every angle seem like a view with unique accessories. The focal point bar arrangements were a huge success in creating a cohesive atmosphere with the green, white, silver details and flowers.